Blue Buckaroo Aussies is so excited to have Spur as a part of our program. He brings awesome bone, structure and temperament to the table. He is our stellar little man in a small package - only 14.5" tall. He has a wonderful temperament, great build and great expression - all backed by over 10 generations of proven healthy and versatile Aussies. Spur is 15.5" and 30 lbs. AKC Registered. 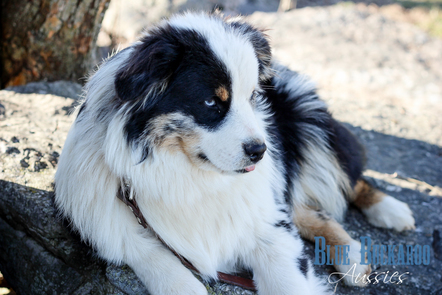 Lovely blue merle boy with copper trim. Smallest in the Litter. Anticipating 30 lbs at maturity. One blue eye one brown eye. Tiny guy! Sweetheart all the way! Sweet little black bi male. One brown eye one blue eye. This guy melts your heart - sweet boy. Lower energy and calm. Should mature out to around 35 lbs. Sweet little black tri female. Two bright blue eyes. Gorgeous little girl. Very attentive and keen. Biddable yet independent. Outgoing and confident. Sweet little black tri male. Bright copper. 2 Blue Eyes. Neat boy! Super keen and biddable. 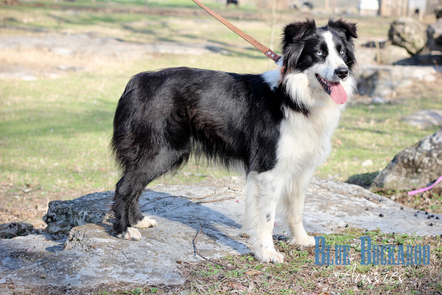 Beautiful black tri colored male with bright copper trim. Two Blue eyes. Very confident, outgoing pleaser. Higher energy, very biddable. Will mature out to around 40 lbs. RESERVED - Thank you Kim! Darling Red Bi Female. Amber Eyes. This little girl is always at my feet waiting for my approval. She is a very biddable girl with a lower energy level. Confident and outgoing. Red Tri Female. Amber eyes. Darling little girl - lower energy, very sweet pleaser.